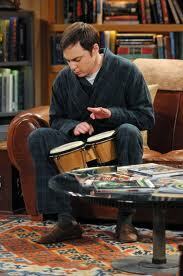 Sheldon likes to play bongos. . Wallpaper and background images in the 生活大爆炸 club tagged: the big bang theory cbs. This 生活大爆炸 photo contains 阅览室, 雅典娜神庙, 雅典, 神经, 庙, 书店, 书摊, and 书架.